I’m sharing this sample activity from my book. It’s part of the last section, which focuses on ways to create a nurturing environment. 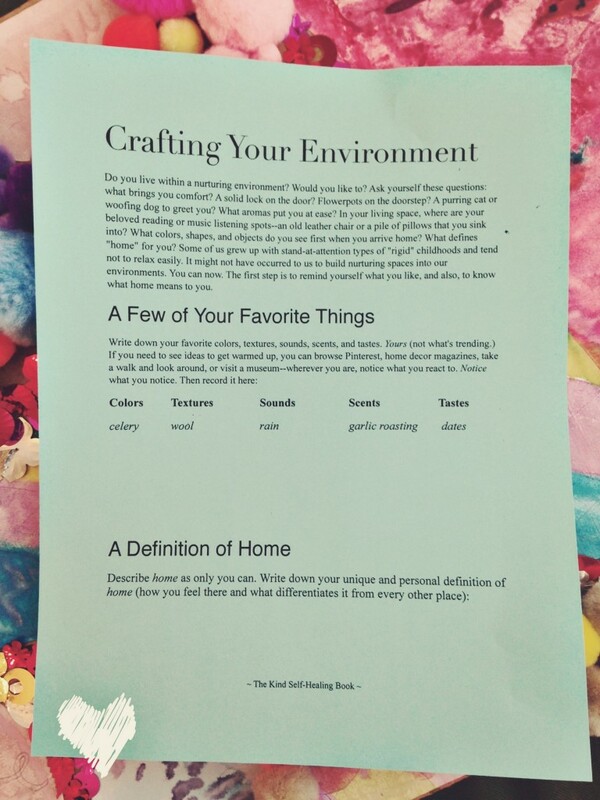 Sample activity page from The Kind Self-Healing Book. • Learn the process of cultivating self-esteem so that is more of a guiding constant in your life, much less hit or miss. • Discomfort felt when advocating for yourself will become less scary and will no longer keep you from doing so. • The purpose that drives your actions will shift to your desires and needs away from anxiety and what you think others want of you. • You’ll learn how to remain centered and calm in the face of criticism (or perceived criticism) and more comfortable expressing your true self. • You’ll become more comfortable in intimate relationships and won’t be distracted by a desire to control situations because you’ll have moved from living in your anxious head to living in the present moment.